Perhaps it’s fitting heading into Labor Day weekend that we should talk about jobs – not necessarily how many Americans have them versus those that don’t and are still searching, but how conditions are improving in the employment market and who’s reaping the benefits. First came the announcement earlier this week that the United States and Mexico had agreed to ditch the old North American Free Trade Agreement (NAFTA) in favor of a new pact that will help even out trade imbalances between the two countries and hopefully put smiles on the faces of workers above and below the southern border. “’It’s a big day for trade. It’s a big day for our country,’ the president told reporters in the Oval Office, who were summoned to watch Trump speak by phone with outgoing Mexican President Enrique Peña Nieto. The “show” Trump put on with Peña Nieto was quite a spectacle. Never before was a man listening to a disembodied voice speak Spanish on an office phone more riveting than it was on Monday afternoon in the Oval Office. With golden curtains as a backdrop Trump calmly reacted to the translation of Peña Nieto’s responses to his questions. Both presidents profusely praised each other and both equally expressed optimism that the new agreement would benefit both nations. The fact Peña Nieto is on his way out as head of state doesn’t appear to be concerning since the incoming Mexican president-elect (Andrés Manuel López Obrador) hailed the new agreement and expressed hope that Canada would be included in the final version. Therefore, it’s clearly up to the Canadians to make the next move and pressure to do so will be enormous. It’s still summer up north but there’s bound to be a chilly reception for Canadian negotiators if they’re not open to changing the way trade is conducted with their country’s southern neighbors. The drama of the Trump/Mexico scene brought this observer back two years when Trump traveled to Mexico during the height of the 2016 campaign season to meet with Peña Nieto. At the time I thought it would turn out to be one of the turning points in the presidential race as the face-to-face served to remove the stigma of Trump being anti-Mexico as well as establishing himself as a would-be world leader who could represent the United States well abroad. It was a “presidential” instant where Donald Trump the unserious celebrity Republican candidate morphed into President Trump the respected statesman. It shouldn’t be forgotten Hillary Clinton’s infamous “deplorables” speech (was she drunk?) came around the same timeframe as Trump’s Mexico visit – a double whammy that brought the Republican’s poll numbers up closer to Clinton’s in the critical post-Labor Day campaign phase. Whoever dreamed up the idea to send Trump to Mexico in late August was a genius. And likewise whoever devised this new U.S.-Mexico trade pact is equally brilliant. Of course Canada is conspicuously absent from the understanding and Prime Minister Justin Trudeau’s voice was not conferenced-in with Trump and Peña Nieto’s. By all appearances Trump and the Mexican leadership get along swimmingly despite serious differences over immigration and the building/funding of the border wall. But first things first – trade is paving the way to a working partnership that will no doubt expose itself in other ways too. The new agreement requires congressional approval and leaders from both parties expressed skepticism that NAFTA should be so easily abandoned, especially without a definitive answer from Canada. In the process Trump’s set himself up with a perfect political scenario – should Congress accept the new agreement it provides the president with yet another promise kept to Americans and proves he gets results where others failed through his legendary business smarts and established personal relationships. If Congress, led by Democrat opposition, rejects the U.S.-Mexico trade accord the voters will most certainly recognize where the sticking point lies. The public sees Trump getting along with the Mexican president and wants good relations between the two countries. If Congress poopoos the new deal congressmen and senators risk angering not only millions of American manufacturing workers, they also likely will be viewed negatively by Mexican Americans as an affront to their ancestral home. The last thing amnesty-loving Democrats want is to infuriate a key constituency like Hispanics. But Democrats also revile the notion of providing Trump such a high-profile victory so close to election time. Oh, the horrors! 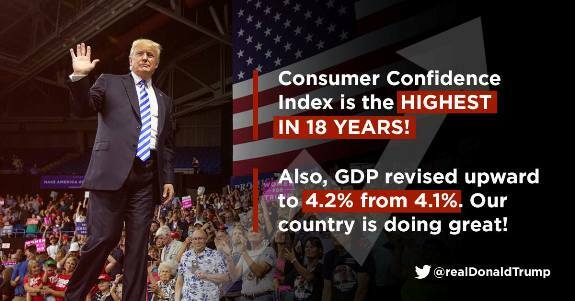 With the American economy already humming along (last quarter’s GDP figure was revised upward to 4.2 percent annual growth), unemployment at near record peacetime lows and consumer confidence the highest it’s been this century, Trump is smelling like a rose where the mathematical figures are concerned. Formerly loyal Democrat voting blocs are also showing massive signs of cracking…all due to Trump. Can it get better than this? According to presidential daughter Ivanka Trump, it can…but will women benefit equally from the new prosperity brought about by forward thinking policies like her father’s trade agreements? Nicholas Ballasy reported at PJ Media, “Ivanka Trump’s address, which took place the day after Women's Equality Day, was focused on ‘women’s economic empowerment’ in the Western Hemisphere. “’Advancing economic opportunity for women in our hemisphere is essential to fostering lasting peace, stability and opportunities to prosper in Central and South America and far beyond,’ she said. In the Western Hemisphere, Trump said women face ‘barriers’ to participating in every aspect of their country’s economy. Not to be one to disagree with a key Trump advisor, but Ivanka sounds just like a Democrat here. Her speech could’ve just as easily been delivered by Hillary Clinton or someone from the Obama regime (or to be fair, the George W. Bush establishment GOP group too). It’s understandable why the president wants his daughter close by in the White House, but what does the administration hope to gain with this namby-pamby “empowerment” stuff? Leftist women who already abhor Trump – and Ivanka – aren’t going to listen to these appeals. Perhaps Ivanka’s correct that women, by the numbers, are underrepresented in boardrooms and politics in certain countries but here in America there are no such legal or cultural barriers to gender advancement. With the onset of technology more and more Americans are working remotely and raising children is increasingly seen as the job of both mother and father jointly. Here in America if there’s a “glass ceiling” at all it’s largely due to factors other than male subjugation of women. Reality suggests by percentage, far fewer women than men aspire to dominate the boardroom. As far as politics goes, more women are running for office than ever. Several of the Republicans rumored to be considered to replace Sen. John McCain are women. These days having a woman in contention for any political office doesn’t even draw special notice (except by the media as if it’s the first time ever). Debate will continue as to the American federal government’s proper role in promoting more business opportunities for women in far off countries – whether it’s even something the taxpayers should be asked to devote precious resources to support. Ivanka Trump says it’s a matter of national security – that by promoting prosperity in our hemisphere (North America) we’re decreasing the likelihood of social unrest and political upheaval in other places. Who’s to say? It’s hard to envision the Founding Fathers approving of American intervention into this area but contemporary U.S. governments seem bent on doing so regardless. And prior to the election everyone knew Ivanka harbored liberal views on social matters where she has her father’s ear. On balance she’s a positive for the administration, primarily because her presence is a moderating influence on Trump’s hard-edged public image. Though it’s highly unlikely Ivanka will win her father additional votes with her “advance women” crusade she won’t cost him any either. Thanks to things like the U.S.-Mexico trade deal the president is already doing a terrific job of attracting new potential supporters to his coalition. Monica Crowley wrote at The Hill, “The much-hyped blue wave may hit a blue wall thanks to the unlikely ‘blue-collar billionaire’ who is directly improving their lives after decades of empty promises from Democrats who took them for granted. “The approval and optimism of the key blue-collar voting bloc — combined with rising approval numbers from other traditionally Democratic constituencies such as African-Americans, Hispanics and young people, who also are enjoying historically low unemployment rates — is an encroaching existential threat to the left. Yes indeed. Having all the work you can handle and a steady paycheck leads to contentment and appreciation for the here and now (as opposed to praying things will get better). In her article Crowley cites poll evidence suggesting working folks are pretty happy with Trump. As indicated above the economic numbers are stellar and it’s reflected in the president’s strength with this core group of supporters, many of whom used to be reliable Democrats. Judging by his constant emphasis on renegotiating trade agreements and “getting good deals” for the American worker, Trump understands that advocacy for the group pays political dividends. Rather than settling back on decades’ worth of lip-service politicians from both parties have relied upon, Trump isn’t afraid to do what he promises either. Whereas all candidates talk about “free and fair trade” Trump’s actually done something about it. Ending NAFTA is huge. The impression that hardly anything is made in America anymore is easily reinforced by a simple walk through Walmart or Costco. Heck, we recently bought a Christmas tree and a family room chair made in China as well as a nine-piece dining room set manufactured in Vietnam of all places. Can’t we make that stuff here? Free traders argue we all benefit from inexpensive consumer goods – and we do – but here's thinking we can flourish from international trade and still protect our people at home. Isn’t that the essence of what Trump is trying to accomplish? Not everyone agrees with Trump’s exclusion of our northern neighbors in the new U.S.-Mexico trade compact. Vance Ginn wrote at The Hill, “It’s now time to bring Canada into the equation. Canada is Americans’ second largest trade partner next to China. Talks have already resumed, and there are positive signs. “The focus should not just be on reducing trade deficits — trade is, after all, a voluntary agreement from which both sides benefit. It should be on making trade more free, not less. It should be on removing tariffs, which in reality are a tax on Americans. And the focus should be on making the U.S. more economically competitive like the passage of the Trump tax cuts last year. Canada will come around. The economic and political demands will be too intense to ignore for Trudeau and his collaborators. Trump and the Mexicans have forced Canada into a corner from which it cannot emerge without making concessions. Ginn is right – free trade is a great thing, but only if it’s a “good deal” for all parties concerned.